Change of plans. I spent several days quagmired in an earnest, heartfelt post on my past, present, and future. Nevermind. Take it as read that for 2015, I want to keep the good bits (husband, health, horse shows) and improve where needed (food habits, exercise habits, work habits). The standard suite of New Year’s resolutions. *Jump a horse. Jump more than once. Jump many fences. Jump with air time. Jump an entire course. Jump cross-country. Jump high. Find a jumping schoolmaster who can get me back in the groove so that the preceding is possible. *Show my own horses. See above. I’d be happy going for lessons. Who am I kidding? I’d be happy cantering peaceably around the backyard. *Start model horse showing. Inspired by a post* on the subject, I decided to check out the only live show in my area, which takes place next month. Then, says I to myself, since I’m going anyway, why not enter? Just for giggles. This way, I can experience the show from the inside. Competitive? Moi? I had no idea if this was feasible. Turns out it is. However, scheduling conflicts will most likely rear their ugly heads. So, this year, I will do photo shows. Next year, I will go to my first live show. Yes, there are other shows within driving distance at other times. However, if I’m going away for the weekend to a show, I’m gonna be riding: my own horse of a preference; a Saddlebred if I may. The plan is for models to be a part-time, secondary, or possibly tertiary, interest. *Go on monthly adventures. In researching the model horse hobby, I have been plowing through the archives of Braymere Custom Saddlery, “I make teeny tiny saddles and blog about all things horse related.” The author often takes trips to shows and other horsey places, such as the Longhopes Donkey Shelter. Blog fodder would be my excuse for such day trips, but it’s mostly impetus to get off the farm. *Learn the Australian crawl. Less discoordinated floundering. More sleek swimming machine. Decrease my level of embarrassment when I am the only one in the pool & the lifeguard has nothing to do but watch me. *Stop buying books. Of course, this will never happen. I could slow down the torrent. You know how some people binge eat when they are hungry, angry, lonely, or tired? I binge buy books. Unlike diets, this goal is not about deprivation. It is about enjoying the many fabulous books I already have, lurking in piles all over my house. It is about cutting back on shopping as entertainment. After all, the point is to read the books, not to accumulate them. *Write 365 blog posts. Then write something other than blog posts. Perhaps publish a short story? Unfortunately, I haven’t written fiction since being traumatized by a professor in college (English departments & I do NOT get along [Origin Story**].) However, the blog is morphing into a black hole. As I type this post in late December, I have already worked on posts halfway through January. Time to divert a little of that blogging energy to other uses. Since posts are better with pictures, an unrelated but seasonally appropriate illustration. 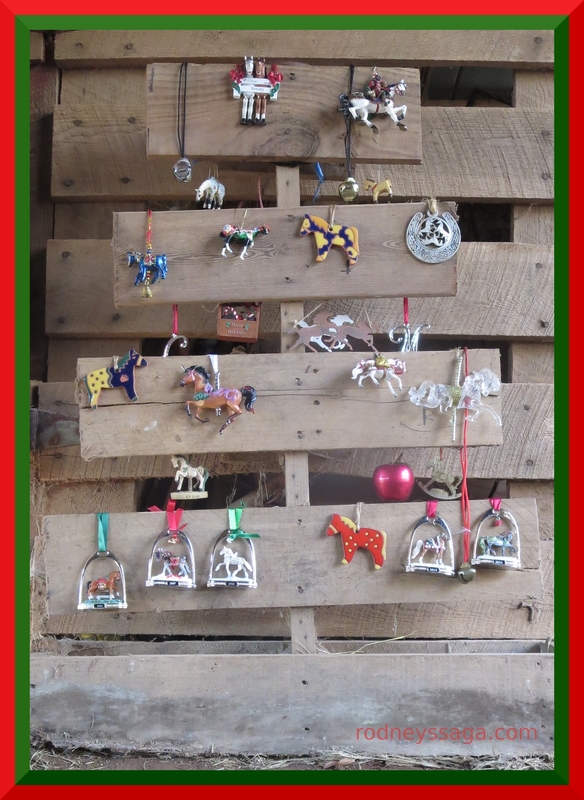 My horse ornaments on a tree cut from a wooden pallet. It’s in front of a similarly-built, unused, wooden stall door. That’s why the visuals are confusing. Love it! Gave me some ideas for 2015, too. If mine was the model horse show blog you referred to, feel free to reblog. With any of mine. I love the ornament picture. What a great way to display all of them! I was – am – really good with an SLR (do you have any idea how hard it is to find someplace that will fix the film into negs and print the pix? Let alone buy film from). So i don’t imagine a DSLR would be too hard. It a bit much trying to get into new habits with my little point and shoot digital camera; the big benefit is knowing right away if you need to re-take a photo; i was brought up using an antique – well, very old – camera of my late dad’s which had not a bell nor a whistle. Got taught to take a lot of pix at different settings to be sure i got a good one. Got my girl scout photography badge on that one. I’ve decided my ‘foto friday’ (thank you again) to share some of those oldies but goodies. I have made only one resolution I’ve ever kept – never to make new year’s resolutions. And i’ve keep it every year. I do remember film. Have to admit that I got hooked on digital. From camera to computer to editor without having to print. Now, I’m not sure I would know how to go back. Yes, digital is easier. But a digital SLR is far, far away in my budget, so i guess I’ll just have to learn all the stuff the digital i do have can do. Funny you should mention. Have book & DVD. Like so far. Must get past chapter 1.